You’re getting a boogieman vibe? Oh, Kyle Reese. Can we just talk about him for awhile? He’s so dreamy. 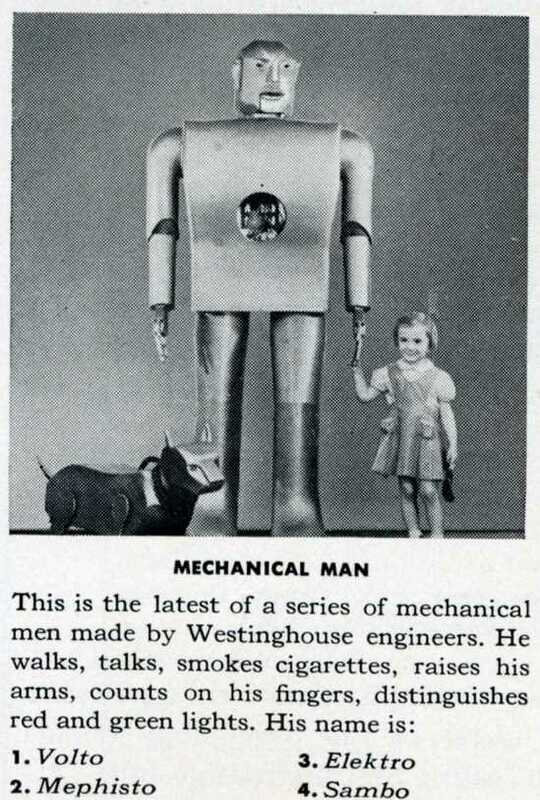 Why have humans been so gol’darn fascinated by mechanical people? Silent movies, Flash Gordon serials, the Jetsons and Lost in Space, to mention just a few. The list could go on and on. All I have to say is: “And his little dog too”. He seems a little stiff to me. I feel relieved. Mephisto smoked cigarettes. Said so right there. You’re correct. Not Sambo. And sure as H not in 2014. I had to go lose all my money at Dave n Buster’s. That’s why I left you hanging. I am sad that you don’t have those lyrics at the ready like moi does bc moi is super intelligent (righto), and also that you had to be reminded of Styxx bc now I am in a deep depression over that and need an Rx for Latuda. The answer is ELEKTRO. Elektro! Not unlike Electro, a character in 1984’s “Breakin’.” That pivotal film contained the song that went like this (you probably also forgot…) “There’s no stopping us (no stopping)…” Come backwards skate to this song with me, Liz. But I googled Latuda and at least get that part. There were so many great tunes in the ’80s, it’s impossible to remember them all. Which is why I need your reminders. But I DO remember Breakin’. Bringing back all sorts of memories–went with my best bud (who I broke up with my other best bud to be best buds with, but the new best bud, Linda, broke up with me the following year because I think I wasn’t cool enough, but at least we had Breakin’) to a local mall theater to see. Remember loving it but also knowing on some level that it was a stupid movie but that didn’t bother me. It was bad. Like my pin-stripe Zenas, they were bad, too. Happy to backward skate with you, but you have to be the backward skater as I never mastered that skill. (Failed all phy ed classes, remember?) Have you pegged as a bad ( 😉 ) skater. I can only backwards skate w/ my right foot doing all the work, so I probably look gimpy out on the wood at this point. Which reminds me, my 600 lb life is on right now. Linda doesn’t know what she lost in you, so clever and wearing pinstriped Zenas, highwaisted as the day is long. It is not possible to fail PE. I got Ds, no kidding. That may not be failing, but I got As in everything else, so it was humiliating. Here’s the kicker: I gave the valedictorian speech at high school graduation and Linda had a bun in the oven. Different directions. Still think she was pretty cool, though. She taught me how to overapply eyeliner by melting the pencil “lead” on a hot curling iron first. Wow. You are SUPER SMART!! I guess Linda has a kid old enough to drink now. Melting eyeliner?? Blowing my mind. totally. And yep, super smart all caps 😉 Did well in school, but let me tell you that all the book knowledge in the world means diddly squat when you have kids. And remember, I told you I studied all the time. Wasn’t kidding. I bet you know PEMDAS off the top of your head. only because my daughter needs it now for math. parentheses, exponents, multiplication, division, addition, subtraction. Bam! Though I thought it was PEMNDA at first and that makes no sense. That mascara trick changed my life. It really does make your eyes pop, I can see that. And the self-confidence is life-changing.